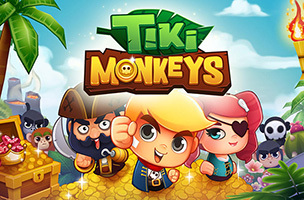 Mobile developer MilkCap has announced the launch of its first mobile game, Tiki Monkeys, on iOS and Google Play. The game challenges players to retrieve a pirate’s treasures from some thieving monkeys, clearing as many rooms as they can before they fail. In each game, players clear rooms by tapping or dragging lines across monkeys to scare them off and collect coins, while avoiding obstacles like spiked fruits, cacti and lava balls. Some rooms contain cannons that shoot fruit at the player, which must also be tapped on to eliminate it from the screen. The more items players clear in one tap or swipe, the more coins they’ll earn as a combo before moving onto the next room. Power-ups appear at random in some rooms, doubling the amount of collected coins or increasing the game’s score multiplier, among others. Players can also collect mystery boxes, which contain whole room skips, premium currency, coins and other prizes. Players can unlock additional pirates for play, using either free or premium items, as well as by liking the game on Facebook. Each pirate has a special ability, like extending the duration of power-ups. Tiki Monkeys is available to download for free on iOS and Google Play. Check back soon to follow the game on AppData, our tracking service for mobile and social apps and developers.